Ako Kondo: Australian Ballet’s newest Principal! At just 24 years of age, Ako Kondo has become the Australian Ballet’s newest Principal Artist. Her promotion was announced on stage at the Sydney Opera House last month after a performance of Giselle in which Ako danced the lead role partnered by her professional and real-life romantic partner, Principal Artist Chengwu Guo. The achievement comes after years of hard work in Japan and Australia, including five years with the AB. Dance Informa’s Grace Gassin speaks with Ako Kondo about making it to the top of the ballet profession and what it took along the way. Ako Kondo. Photo by Justin Ridler. Congratulations on your promotion! What did you do to celebrate? I heard your mother flew from Japan to be there for the big announcement! Did you get much in the way of congratulation from the other Principal dancers? I know you’ve not had much time yet as a Principal, but in the little while since your promotion, have you noticed differences, perhaps in your schedule, in your dancing routine compared to the one you enjoyed as a Senior Artist? “My schedule has actually remained much the same which is interesting, but it’s only been a few weeks! Gorgeous Ako Kondo in rehearsal for ‘Cinderella’. Photo by Kate Longley. Your boyfriend is Chengwu Guo, who was also named a principal at the same age. What’s it like to be in a romantic relationship with someone with whom you also have a strong professional relationship? Many young dancers have looked up to you and will continue to do so over the course of your career. Who did you look up to as a dance student? “I’ve always loved Svetlana Zakharova, she’s a Principal in the Bolshoi Ballet. I think the first time I watched her was in the Don Quixote pas de deux in Japan, where she was a guest artist in a gala. She’s just got the look of a ballerina, beautiful legs, beautiful face, but then her performance is just amazing. I just felt something in the audience, she inspired me and I’ve always looked up to her. Actually, when I was learning Giselle I watched her Giselle DVD a lot because it’s one of the best roles she’s ever done. I’ve got to say, I’m jealous of you for getting to see Svetlana Zakharova dancing live in Japan! 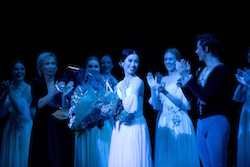 Ako Kondo receiving her promotion following ‘Giselle’. Photo by Lisa Tomasetti. You mentioned that your English was not as polished when you were younger which must have been hard when you first arrived in Australia as a young dancer from Japan. What were some of the challenges you faced? “Yes, I think in the beginning English was a problem – I didn’t have English at all. Ballet is all about body language though, you don’t need to speak up. That helped me a lot in class and with making friends. But I also had a problem with my body. I felt like, well, as I said, I think dancers like Svetlana have beautiful long legs, tiny face, beautiful feet — and I always thought ballet was for European people or Russian, western people, not for Asians, because being Asian you get short arms, short legs, you know, and hips that won’t turn out. When I came to Australian I thought everyone had beautiful long legs and I didn’t want to look at myself in the mirror because I could tell how bad my body was! Channelling Miyako Yoshida’s self-awareness, how do you think your own dance quality differs to that of other senior artists and principals in the company? “My strength would be my technique, I’m quite reliable and I’m also an energetic dancer— I always get cast for jumping and turning roles because I’ve got the technique and energy to push, and my excitement comes out on stage, so roles that tend to suit me are ones like Kitri from Don Quixote and Gamzatti in La Bayadère. What advice would you pass on to younger dancers who aspire to be a principal one day like you? Photo (top): Ako Kondo in ‘The Dream’. Photo by Kate Longley.